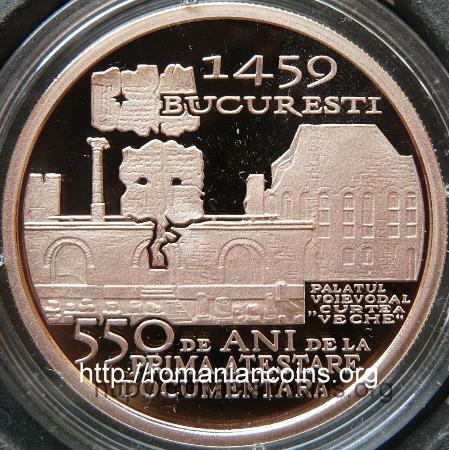 Obverse: ROMANIA, face value "1 LEU", year 2009, coat of arms of Romania, bust of prince Vlad Ţepeş, on the left side of his chest inscription VLAD TEPES, at left ruins of the palace known as the "Old Court" (Curtea Veche) from Bucharest Reverse: broader view of the princely palace "Curtea Veche" in Bucharest, above two pieces of parchment belonging to the document of Vlad Ţepeş inside which the first attestation of Bucharest is made, inscriptions 1459 BUCURESTI, PALATUL VOIEVODAL „CURTEA VECHE”, 550 DE ANI DE LA PRIMA ATESTARE DOCUMENTARA meaning "1459 BUCHAREST", "PRINCELY PALACE OLD COURT", "550 YEARS SINCE THE FIRST DOCUMENTARY ATTESTATION"
Obverse: ROMANIA, face value "10 LEI", year 2009, coat of arms of Romania, bust of prince Vlad Ţepeş, on the left side of his chest inscription VLAD TEPES, at left ruins of the palace known as the "Old Court" (Curtea Veche) from Bucharest Reverse: broader view of the princely palace "Curtea Veche" in Bucharest, above two pieces of parchment belonging to the document of Vlad Ţepeş inside which the first attestation of Bucharest is made, inscriptions 1459 BUCURESTI, PALATUL VOIEVODAL „CURTEA VECHE”, 550 DE ANI DE LA PRIMA ATESTARE DOCUMENTARA meaning "1459 BUCHAREST", "PRINCELY PALACE OLD COURT", "550 YEARS SINCE THE FIRST DOCUMENTARY ATTESTATION"
Vlad was one of the sons of Vlad II Dracul, thus being nephew of Mircea the Old. His father's name should be translated as Vlad the Dragon, as Vlad II Dracul had been made member of the Order of the Dragon by the Holy Roman Emperor Sigismund of Luxemburg, but ad litteram Vlad Dracul means Vlad the Devil, an approximate translation of Dragon. 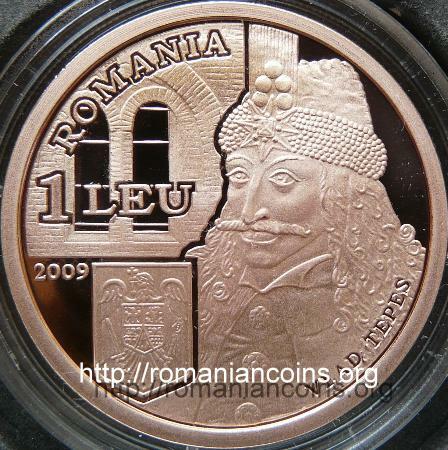 Vlad II Dracul ruled Wallachia between 1436 and 1447 (with interruptions). Vlad Dracula was the name that Vlad III the Impaler (Ţepeş in Romanian) used to call himself along other sons of Vlad II, having the meaning of "son of Dracul" - Drăculea in Romanian. The name of Impaler was given to him by the Romanian people, being related to his preferred way of enforcing justice. The first rule of Vlad Ţepeş took place in 1448, when the voivod occupied for a very short period the Wallachian throne, with Ottoman help. Vladislav II, the actual ruler of Walachia, was departed in the anti-Ottoman campaign south of Danube of year 1448, as an ally of Iancu of Hunedoara (referred mainly as John Huniady), regent of the Kingdom of Hungary. The expedition ended with the defeat of the Christians at Kosovo Polje (Field of the Blackbird). Vladislav, returned from the campaign, recovered his throne in a very short time. The second and main rule of the Impaler began in 1456, after the defeat of Vladislav II (with Hungarian help). This rule ended in 1462, following the Ottoman invasion led personally by sultan Mehmet II, the conquerer of Constantinople. The small Walachian army tried to slow the Turkish advance by guerilla techniques and ambushes, including a bold Night Attack. 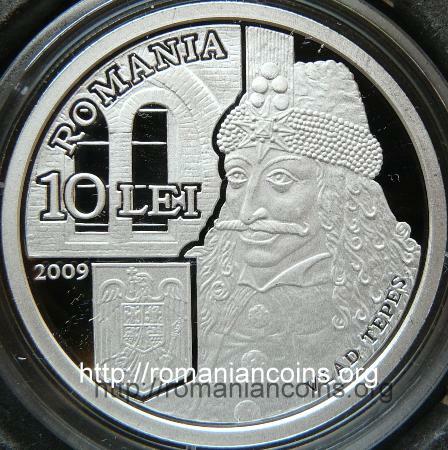 Some of Vlad's boyars were disloyal to the voivod, and the throne was occupied by Radu cel Frumos (Radu the Handsome). After having retreated to Transylvania and in expectation of help from Matthias I, the king of Hungary (Matei Corvin, in Romanian), Ţepeş was accused of treason (on grounds of some fake letters) and the intended expedition aimed at recovering the throne of Walachia for Vlad was cancelled. In his constant effort to re-enroll Wallachia into the anti-Ottoman front, Stephen the Great, prince of Moldavia and cousin of Vlad III Dracula, tried and succeded several times in replacing the Walachian voivod with rulers hostile to the Turkish party. In such an attempt, in november 1476 Vlad Ţepeş reassumes the throne of Wallachia, with Moldavian and Hungarian support. This reign lasted only a month, Vlad being killed by Laiotă Basarab (who returned with Turkish support), the ruler he had just ousted. 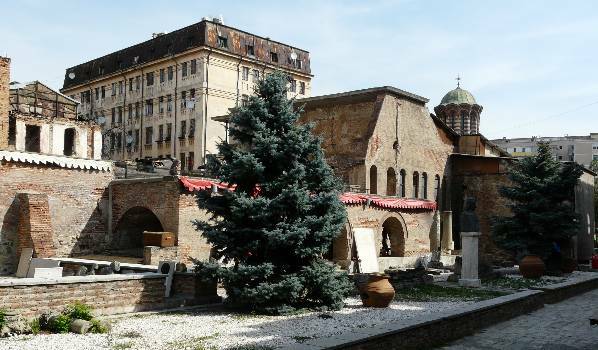 The severed head of the brave voivod was sent to Constantinople, and the body - as the popular tradition puts it - was burried at Snagov Monastery. The city of Bucharest is very old, but the first documentary attestation known today is a diploma gave by Vlad Ţepeş, from the "fortress of Bucharest", to Andrei, Iova and Drag, three Walachian boyars. 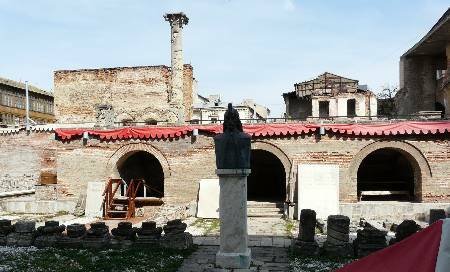 During the rule of Ţepeş constructions were made to the "fortress" of Bucharest - historian Giurescu supposes that the fortress was remade, the very fortress amid whose walls the princely houses lay. 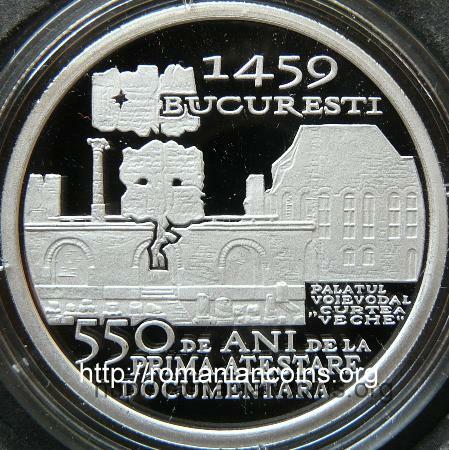 A document of Radu the Handsome in 1465 names Bucharest see city, so one of the Wallachian capitals.